Genki Ogasawara (Aoi Nakamura) enrolls in an all boys high school. He then sets out to become popular with girls and looks for a club to join at school. Genki then comes across a performance of "Romeo and Juliet" performed by the school's drama club. Genki falls for the lead playing Juliet and decides to join the drama club. Genki isn't aware that the drama club is about to be shut down and that the person playing Juliet is actually a senior male student in drag. Genki is shocked. 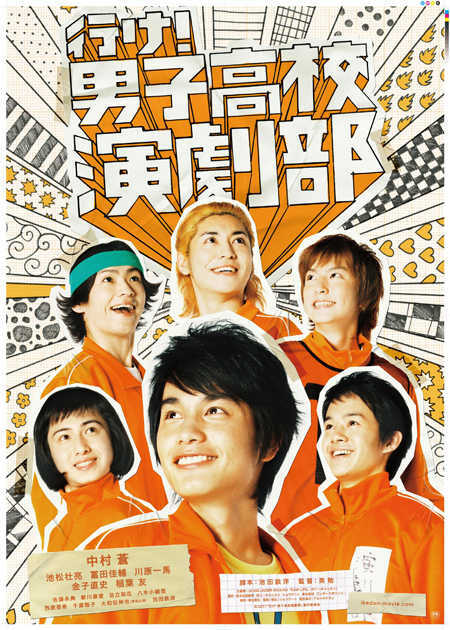 Having joined the drama club, Genki is quickly chosen as the group's leader. The only two other members are Joe (Naofumi Kaneko) and Ueda (Keisuke Tomita). An advisor for the club Kanda (Tetsuhiro Ikeda) is only interested in girls. Kanda himself is an idol otaku and doesn't have interest in the drama club. The club is in trouble, because the club will be shut down by the end of the month if it doesn't get 5 members. The club members in desperation persuades Tamura (Kazuma Kawahara) to join. Genki also puts his friend Kaji (Sosuke Ikematsu) on the member list, telling him that he doesn't have to do anything. With 5 members in the drama club the group is able to stay intact. The club now has to take part in a play contest. The members in the drama club have no clues on what they should do for the contest so they decide to visit a female high school famous for their drama club. The guys dress up as girls to visit the school. At the female high school, Genki quickly falls in love with Mai (Yua Shinkawa) who is performing on stage. The members then see Mai getting pushed by another girl Kaneko (Masako Chiba) & the guys decide to come to Mai's rescue. mai_tiyan May 30 2013 1:03 am I really love this movie, I was laughing laudly from the beginning till the end, it was so funny, refreshing and reminding me of my high school memories, because i was also joined with Drama Club before... so i know how the feeling... the excitement before going on stage, the preparation.. cool... so many wonderful memories.. just like this movie.. very good.. love this..